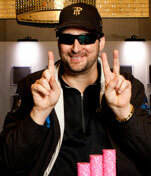 In 2001, I was heads up with Scotty Nguyen in Omaha 8 or better with a chance to win my eighth title; I lost. In 2002, I was heads up with Johnny Chan in no limit Hold’em with a chance to win number eight; I lost – instead Chan won number seven to tie me. This time I needed to win! There have been certain times in my career where I’ve felt an uncanny, almost other-worldly feeling playing poker, like I had entered a zone of complete talent and dominance. When I enter that zone, I know the time is ripe to take down a championship. So although I was playing great poker and was ready to take down Young, he wasn’t going for it. He brought his “A game.” Back and forth we battled, 100 hands, then 200 hands, and finally we crested 300 hands of one-on-one poker, and neither of us would back down. Grueling heads-up play like this feels more like a chess match, and sometimes you have to get creative and surprise your opponent. 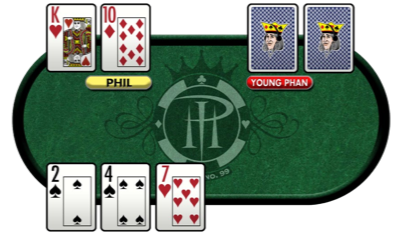 We were playing $3,000-$6,000 limit when the following hand came up and gave me the confidence to win — and hopefully took a little steam out of Young Phan’s sails. I looked at my hole cards and found myself with K-10 offsuit. And then the flop came down 2s-4s-7h. Young checked, and then I bet out $3,000. Now Phan check-raised me, making it $6,000 to go. I checked my hand to see if I had a spade in case two more spades came down in the next two cards. I didn’t have a spade, but decided to call Young’s $3,000 bet anyway. 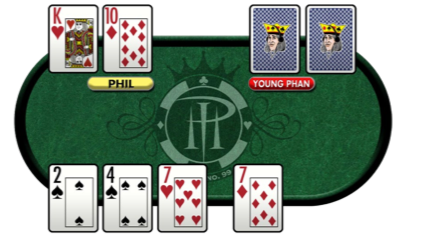 Then, the 7d came out on the turn for a board of 2s-4s-7h-7d, and now Phan bet out $6,000! I felt like the right play was to fold (Phan could have me beat with any pair or ace high, or have me crushed with trip sevens), but something inside me said, “Now is the time to call, you have the best hand, Young has a straight draw or a flush draw. 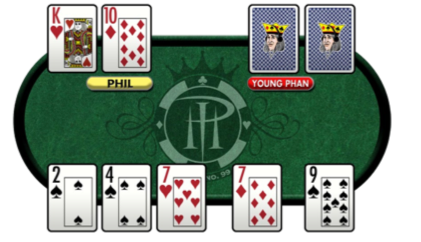 Phil, don’t blow this opportunity!” And plus, folding in this situation is what got us to a standstill after 300 hands played. I wanted to throw something different at Young. I decided to trust my instincts. I called the $6,000 bet. In my mind I believed that Young had a straight draw of some sort, like he was holding hole cards like 6-8. The last card was the 9s, for 2s-4s-7h-7d-9s, and Young bet out $6,000 again! Let me just ask you at this point: what do you think he was holding? What would you have done if you were me? I’m sure that Young heard that one as well. I’m telling you, it doesn’t get any better than making a killer call like that — it shows you that your instincts and reads are dead on. It can also demoralize your opponent a bit, especially at a tournament as big as the WSOP. To Young’s credit, I didn’t see him lower the level of his play very much at all. I really think this type of play redirected the entire energy of the game. He got called out on a big bluff and that just makes a player feel so visible. And, it was all over just a few hands later when Young and I were all-in in the dark, his 6-2 to my 6-4, and a 4 on the turn gave me my eighth WSOP Championship. I give all of my bracelets away to family and friends, with the exception of the very first one that I ever won, which I kept for myself. It’s always the best moment of my year when I get to do so, and this particular bracelet went to my youngest son, Nick!